Political Art is not Historical Art. 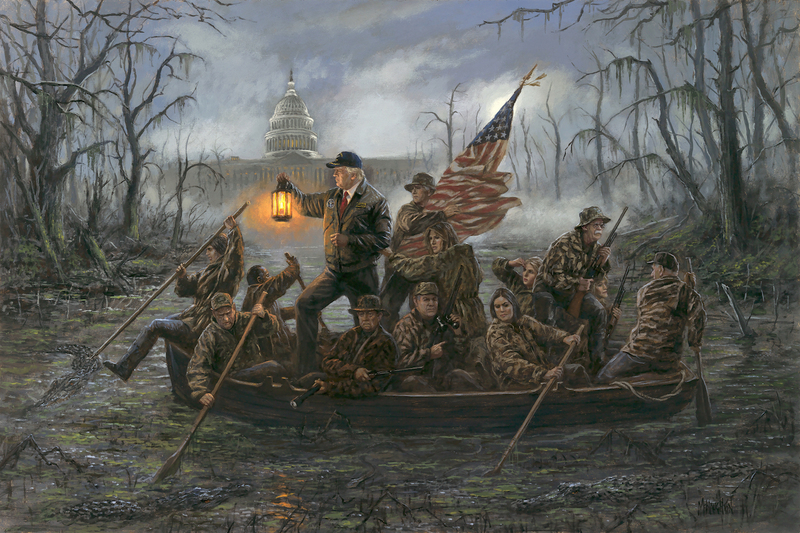 In keeping with his years long tradition of making political oil paintings and lithographs satirizing and glorifying the Trump administration, Brigham Young University adjunct professor Jon McNaughton has produced “Crossing the Swamp”. An oil painting with numerous gliclees and lithographs resulting from it, inspired by the German-American painter Emanuel Leutze’s 1851 painting, Crossing the Delaware, McNaughton has raised my ire while appealing to those who support Donald Trump and adhere to his admonition first uttered at a 2016 campaign rally in Madison, Wisconsin to “drain the swamp”. I am disturbed that he would conflate the image of George Washington, who famously refused the office of King, uttering, “I did not fight George III to become George I”, and who reluctantly agreed to command the Continental Army for his country’s good with Mr. Trump who pursued four deferrals from military service before his successful deferral due to bone spurs (even though he went to military high school). I am distressed that this artist would depict Trump as George Washington who, on the way to his inauguration in New York, left New Jersey early in the morning after people gathered in a boisterous farewell at Philadelphia’s City Tavern, “to avoid even the appearance of pomp or vain parade” (from the newspaper of the day), when Mr. Trump planned a military parade costing millions to adulate himself and his reign. I am incensed that Mr. Trump is conflated with General Washington because upon getting to Trenton, where President-elect Washington had fought the British and Hessians, women met him with a banner proclaiming “The Defender of the Mothers will also Defend the Daughters” as young girls scattered flowers at his feet, when Mr. Trump neither defends women nor their children, daughters (and sons), but rather abuses and imprisons them. The boat depicted in Mr. McNaughton’s painting, allegedly sailing up the Delaware (although observed from the shore of the Rhine River) contains Nikki Haley, James Mattis Ben Carson, Donald Trump, Jeff Sessions, Mike Pence, Melania Trump, Mike Pompeo, Sarah Sanders, Ivanka Trump, Jon Bolton, John Kelly and Kellyanne Conway. Also aboard are Native Americans, Africans, Scots, statesmen and heroes James Monroe, General Nathaniel Greene and Edward Herd adding military heroes and statesmen to Trump’s crew. Artistically, there are several ways this painter has not paid attention to detail; rifles held upside down, the people sitting in a boat that would have had ice on its floor; ice floes more reminiscent of the Rhine than the Delaware, flying a flag that did not yet exist. Even if it had, that flag no longer stands for the United States of America for which General Washington and his Continental Army fought for and sacrificed so much. Satire has long been used, both in print newspapers and magazines, and now on the Internet and web. It is our right entrusted in the Constitution’s first amendment to freely express ourselves. But to conflate America’s forefather, selfless hero, first President and Commander- in- Chief, with someone who I believe would be king if he had the choice demeans the office, George Washington. Perhaps McNaughton’s next painting might be Trump taking the oath of office where President Washington did, on the steps of Federal Hall, where in 1737, John Peter Zenger fought for the rights of the press to speak the truth. After that inauguration, where the crowd shouted “Long live George Washington, President of the United States”, he left to address Congress. He implored Congress to sit after bowing to the Representatives and Senators, to distinguish this Congress from the British House of Commons which stands when addressed by the Monarch. Clearly, President Washington should not inspire any artist to depict his visage as Donald Trump, nor his corrupt cabinet members and advisers as Washington’s adjuncts who gave their all, with very little recompense, to the founding of this nation. Furthermore, it has recently come to attention that a high-quality laser print , The Republican Club, by Carthage, Missouri based painter Andy Thomas, of President Trump with Abraham Lincoln, observed by every Republican president who has served the U.S. hangs in Trump’s persona dining room at the White House. A female figure stands in the background, attesting to the possible future woman who holds the office. While many prints have been sold in gift shops and online, the original is retained by the artist. As in McNaughton’s painting, I cannot imagine the chagrin of Lincoln, Bush, Reagan, and other presidents depicted in Trump’s company. They are all laughing, at this very sad joke.